An Indian boy near a river in Nashik, Maharashtra, India. Water pollution is a major environmental problem in India, as the photographer saw on his trip through the country. Water pollution is a major environmental problem in India, that Kristian Bertel has portrayed here in this Nat Geo Challenge called #TellYourPollutionStory. He was traveling through India and saw how the rivers and lakes in India often used to abandon waste, and how many places were plagued by this pollution. When moving around the travelers in India one can not help but notice the polluted water. 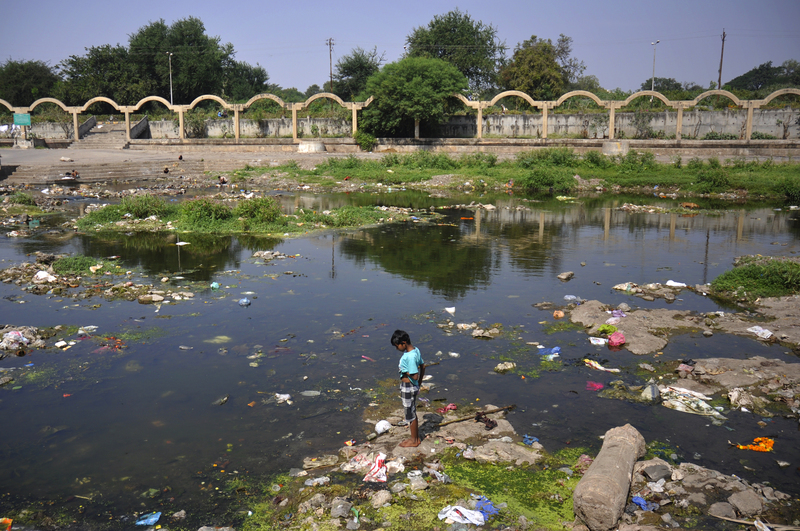 Most rivers, lakes and surface water in India is in fact contaminated. It is the discharge of untreated sewage, which is the main reason for pollution of water and groundwater in India. There is a big gap between generation and treatment of domestic waste water in India. The problem is not only that India lacks sufficient treatment, but also to the treatment plants that are not working and not maintained. Most of the state-owned plant in India remains closed most of the time due to improper construction or poor maintenance or simply because there is a lack of reliable electricity supply to power plants with absent staff and poor management. The waste water generated in these areas usually seeps in the ground or evaporates. The collected waste accumulate in urban areas leads to unsanitary conditions and releases pollutants that leach into surface and groundwater. There is a big gap between generation and treatment of domestic waste water in India. The problem is not only that India lacks sufficient treatment, but also that these treatment plants are not maintained. In India there are also many places tradition to cremate the deceased directly into the Ganges River, which is also a reason for India’s water pollution. Another reason for the pollution of India’s water is that there is a lack of toilets and sanitary facilities, causing open defecation in rural areas and in some urban areas in India. Things are also happening in many other developing countries worldwide. Other causes of water pollution in India include agriculture, where the test sample is filled with pesticides that afterwards found in rivers, lakes and ground water. Flooding during the monsoon exacerbate India’s water pollution problems since the flooding and moves the solid waste and contaminated soil to India’s rivers and wetlands. Water is a precious commodity in India even more than in many other countries around the world. In a land of contrasts that India is living 16 percent of the world population, but there are only four per cent of drinking water resources. Drought and water shortages are major parts of everyday life in India, it is also why water is a major challenge for the country. The Indian industry has a large pent-up demand in water management. Investment in equipment, maintenance and training of professionals is the order. Groundwater and surface water are somsagt deficient in India, where the industry is about five to 10 percent of the total demand for fresh water, which is increasing. Meanwhile, factories, power plants and refineries contributed to cause a substantial portion of the amount of wastewater. Investments are therefore in the long term necessary in India to bridge the gap between 29 billion liters of wastewater per day, which only has a processing capacity of just six billion liters a day. To support the work of the Global Commission on Pollution and Health, to be published in The Lancet in the spring of 2017, National Geographic are calling all photographers to #TellYourPollutionStory. The report will shed light on new evidence that pollution, in all its forms, air, water and soil, is the leading cause of death in the world, taking almost 10 million lives annually. Many forms of pollution are invisible, creating a challenge for photographers. Sometimes pollution is felt, not seen. Often it is not felt at all, but is still a serious, silent threat. They want to know what it looks like through our eyes and how pollution is impacting our community. Perhaps we have seen an environmental cleanup project, or have benefitted from a pollution control project. The Commission wants to know, through our words and images, how pollution has changed life in our community over the past 30 years. Have globalization and economic and industrial growth brought increased pollution and changed local life? Entries will be displayed via a map and shared with leaders around the globe.